This interactive eLearning course is a complete package for those wishing to become TOGAF Certified. There are no pre-requisites for taking this course, although you must pass the exam at both levels in order to achieve TOGAF Certification. With this course, you’ll receive 12 months access as well as FREE combined (level 1 & 2) exam voucher to use within 12 months of courses access. Just contact us when you are ready to sit the exams! Please note that if you require separate exam vouchers, this can be provided but will be at an additional cost. This course is ideal for anyone wanting to learn TOGAF at Foundation and Certified level in quick succession and become a qualified TOGAF practitioner. Many students prefer this combined approach as it tends to reduce both time spent learning and also costs! Why Study TOGAF Certified With 4PA? This TOGAF 9 Certified eLearning course is approved by The Open Group as a fully accredited training course. This combined TOGAF eLearning course contains all the learning materials needed in order to prepare for both the TOGAF part 1 exam and TOGAF part 2 exam. The course syllabus includes both the core concepts of the TOGAF Framework (Foundation level) and also shows students how to apply this knowledge in the real world as a fully qualified TOGAF architect. Browse the contents of this eLearning course by clicking on a module title below that you would like to know more about. Visit our exams page to find out more about sitting the TOGAF Foundation exam. This module introduces the basic concepts of enterprise architecture, The Open Group and the TOGAF architecture framework. The TOGAF 9 architecture framework is divided into 7 parts, each part addressing a different aspect of the architecture framework. The purpose of module 4 is to introduce you to the Architecture Development Method cycle by briefly explaining the objective of each phase in the cycle and how to adapt the method for use in an organization. You should now understand the objectives of all the phases in the Architecture Development Method, including the Preliminary Phase and Requirements Management. The focus on the Architecture Development Method continues in this module by looking at each of the method phases in more detail. The aim is to understand how each phase contributes to the success of enterprise architecture by focusing on the approach for each phase. At this stage of the course you should have a good understanding of each phases of the architecture development method. In module 6 we introduce the Architecture Development Method Guidelines and Techniques that are available to architects when they are executing the different phases of the method, including business scenarios, architecture principles and the gap analysis technique. For the foundation level exam you must understand the objectives of the different guidelines and techniques but you are not required to understand how to implement a technique on a project. Good stakeholder communication is a key requirement to successfully create an architecture definition in TOGAF 9. This module studies the concepts of views and viewpoints using the ISO 42010 standard, which is an international standard supported by TOGAF and used to define the viewpoints in the TOGAF Content Framework. A key benefit of enterprise architecture is the ability to re-use architecture, business or technology components on different projects or in different parts of the organization. The concept of architecture and solution building blocks is described in this module, including the use of building blocks as reusable components within TOGAF. During each phase of the Architecture Development Method a set of key deliverables are generated. These deliverables are used as the input for other phases and as the outputs that are consumed by a wide range of stakeholders. The purpose of module 9 is to highlight the key deliverables of each phase in the Architecture Development Method. The Enterprise Continuum is a classification schema that can be used to organize the content of your enterprise repositories. In this module we will explain the concept of the Enterprise Continuum together with its purpose, and constituent parts. You should also understand that the architecture continuum and solutions continuum are both components of the enterprise continuum. In module 11 we will have a closer look at the architecture repository, which is used to store and manage architecture content produced and consumed by the Architecture Development Method. You will be able to see that you need more from an architecture repository than just being able to store your architecture models! In this module we will introduce the two core reference models for foundation and common systems architecture defined in TOGAF that you can be added to the Architecture Continuum: the Technical Reference Model (TRM) and the Integrated Information Infrastructure Reference model (III-RM). The last module of this course focuses on the “people” side of architecture by introducing you to the architecture governance concepts available in TOGAF. You will look at the Architecture Capability Framework, and specifically, how architecture governance contributes to the successful execution of the Architecture Development Cycle. You should now realize how important it is to govern architecture within your organization. This module looks again at the key concepts and learning outcomes for TOGAF Foundation level certification and should be used an aid when preparing for your exam. It is structured to reflect the key learning units required to pass the foundation level exam. Each learning unit is linked to the appropriate sections in the online TOGAF standard to enable you to quickly refer to the source information. See how much you have learnt so far by taking a mock up test modeled on the actual Foundation Level Exam. The first lesson is about the Preliminary phase, which is programmatic element of the architecture development method wherein the EA team is established, the governance is set up, the framework is tailored and other such things in order to set up the EA project for success. In module 1, we discuss how in the preliminary phase, it is important to set up architectural governance in order to have successful architecture projects through a sustainable EA capability. In this module 2 we dig a little deeper into architecture governance. This lesson is on business scenarios techniques and how they help to drive high-level business requirements for an architecture project. This is on phase A of the architecture development method: the Architecture Vision. In this module we’ll explain how to apply this critical phase in the development of an enterprise architecture. Part of the inputs to this phase will stem from what was developed in the preliminary phase in terms of knowledge about the architecture practice, our governance, our team and our principles. This module looks at the Architecture Content Framework. We will explain the purpose of this part of TOGAF, explain the main components and how the Architecture Content Framework relates to the Architecture Development Method. This lesson is on stakeholder management, which is considered a critical technique for TOGAF. In this module, you will learn how to apply the stakeholder management technique, the steps involved in developing the Stakeholder Map Matrix and how to use it as a guide to identify key players, their concerns, and which visuals or artefacts or viewpoints will help address these concerns. The purpose of this lesson is to explain the TOGAF content meta-model, which is a key part of the TOGAF Content Framework. The learning objectives for this module are to get to grips with the core meta-model concepts, it’s elements, and extensions to the meta-model. This module is on architecture implementation support techniques, and how these can be applied to assist with implementation of architecture development work. One of the key elements here and one of the key techniques is how to reconcile interoperability requirements. In this module we discuss phase B of the TOGAF ADM and how it can be applied to develop architecture inputs for your enterprise transformation efforts. Business architecture is the main bridge between the vision of architecture change and the linkage to change in the information systems and technology environment. In this lesson we will focus on the heart of business transformation, moving toward Boundaryless Information Flow (The Open Group vision) and enhancing target information systems architectures from a data architecture perspective. We will look at the dynamics between data architecture and application architecture, and the inputs, steps, and outputs (as we do with all phases). This module looks at Phase C, and business transformation from an application architecture perspective. This includes understanding the dynamics between data architecture and application architecture, and then looking at inputs, steps, and outputs, as we do with all phases. Finally, to help see how to adapt the generic ADM, we continue with a Security Architecture overlay. This helps us look at how we can advance both Phase C and Security Architecture in a synergistic, disciplined, and comprehensive way. In Module 12 in which we will cover TOGAF’s Technical Reference Model, which is an example of a Foundation Architecture in TOGAF’s Enterprise Continuum. We’ll cover key aspects of the TRM graphic and structure and the architecture objectives related to the use of the TRM in the ADM. It is important to remember that the TRM is generic; we will discuss as well how it could be tailored to be Organization-Specific. In Module 13 we will deal with the Integrated Information Infrastructure Reference Model, one of the two TOGAF reference models, with this one being focused on Boundaryless Information Flow. We will provide background for the business and technical drivers for Boundaryless Information Flow and how the Integrated Information Infrastructure Reference Model or “Triple I-RM” satisfies the solution space with it’s structure, graphic, and components. Phase D describes the development of a Technology Architecture. This phase of the ADM is critical to understand, especially because EA is related to business transformation in light of the overall technology that architecture addresses. As with all ADM Phases, Phase D consists of inputs, steps, and outputs and we will also provide a Security Architecture overlay to our generic discussion of this phase. This module looks at the techniques used to support migration planning in Phases E and F.
We look at 5 phases: the Implementation Factor Assessment and Deduction Matrix; the Consolidated Gaps, Solutions, and Dependencies Matrix; the Architecture Definition Increments Table; the Transition Architecture State Evolution Table (which leverages the TRM) and the Business Value Assessment Technique. This module describes the process of identifying delivery vehicles (projects, programs, or portfolios) that effectively deliver the Target Architecture identified in previous phases. As we move through Phases E&F, iteration will occur around Solution Building Blocks in the forms of work packages, projects, and portfolios to address the capability transformation scoped in Phase A. This module addresses migration planning; that is, how to move from the’Baseline’ to ‘Target’ Architectures by finalizing a detailed Implementation and Migration Plan. Phase F is an extremely important phase because it pulls together the stakeholders and the planning necessary to make key solutions and sequences of associated work packages. Phase G It is where all the information for successful management of the various implementation projects is brought together. With Phase G we have moved to a Critical Partner role. In this role we can still greatly influence the development of envisioned, enhanced enterprise capability. Phase H entails a lot more than the title implies. Besides Architecture Change Management, Phase H also plays a key governance role, establishing procedures for managing change to the new architecture. Requirements Management is central to TOGAF’s Architecture Development. This module looks at the process of managing architecture requirements throughout each phase of the ADM. Like the other 9 phases in the ADM, we use an pattern of inputs, steps, and outputs, and do a Security Architecture overlay. In this module we discuss the classification criteria that are generally applied to architectures and how they can be leveraged to partition the enterprise into a set of architectures with manageable complexity and effective governance. For a large and complex Architecture Project, Architecture Partitioning may be essential. In this module we will look at how TOGAF provides a structural framework for an Architecture Repository that allows an enterprise to distinguish between the different types of architectural assets that exist at different levels in the organization. We will look at the key parts of the repository and how it supports the other parts of TOGAF. In this lesson we look at Guidelines for Adapting the ADM in terms of Iteration and Levels. Iteration is a fundamental aspect of the ADM; the concept of levels helps to manage the complexity of EA development work. We have already been looking at Security Architecture and Concerns in all the ADM Phases, but in this module we will take a closer look at the area of Security and the considerations that should be made during the application of the ADM.
Having just looked at how to adapt the ADM for Security, in this module we will look at guidelines for adapting the ADM for the Service-Oriented Architecture style of architecture. Maturity is a critical aspect of Architecture Capability that needs to be assessed and addressed as part of the development of any Organization-Specific Architecture Development. In this lesson, we provide background on Capability Maturity Models and Capability Maturity Model Integration (CMMI). Then we show how maturity assessments link to the ADM. The TOGAF Architecture Skills Framework provides an assessment of the roles, skills, and experience norms required to deliver a successful enterprise architecture, and we will introduce it at a high level in this module. Thinking of sitting a combined TOGAF Certification (level 1 & 2) exam? On this page, you will find everything you need to know! When you think you are ready to take the TOGAF combined exam, you can book it online using the free exam voucher provided with each course. Just contact us for your voucher when you’re ready. Each eLearning course comes with a revision module that gives you an overview of the course and the key principles and concepts that you need to understand in order to pass the TOGAF Part 1 & 2 exams. This exam is the first part of a 2-part certification process for TOGAF 9.1 Certification and can be taken after the completing the TOGAF Foundation eLearning certification course. Once you have completed the TOGAF Foundation training course, you can check if you are ready by taking the practice test that is integrated with the course. It has been designed to simulate the types of questions and format of the actual exam. This exam is the second part of a 2-part certification process for TOGAF 9.1 Certification and can be taken after the completing the TOGAF Certified eLearning certification course. Once you have completed the TOGAF Certified training course, you can check if you are ready by taking the practice test that is integrated with the course. It has been designed to simulate the types of questions and format of the actual exam. 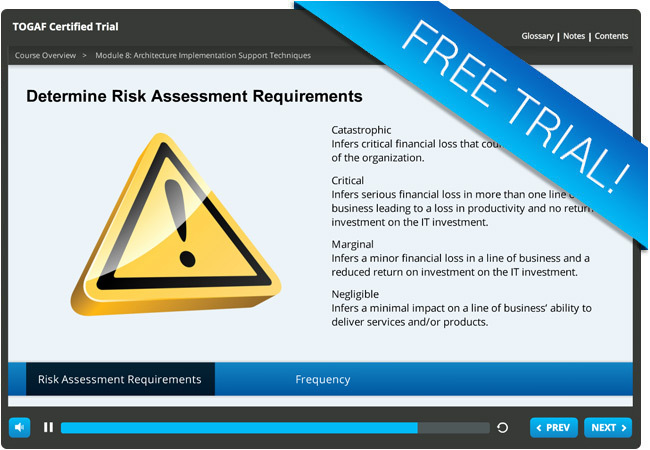 Try a FREE trial module of our TOGAF 9 Certification (level 1 & 2) eLearning course! With this trial, learn the basic concepts of Enterprise Architecture and TOGAF as well as how to apply different techniques that will assist with Architecture Implementation. Like the full TOGAF Certification (level 1 & 2) eLearning course, you can access this free trial module from any device whether you are at home, at work, or on the move!